We found 10 episodes of Trending with Timmerie with the tag “christian”. It’s Easter! Now is the time to continue purging sin and growing in holiness. Father Tim Grumbach joins Trending with Timmerie Geagea to discuss how we can continue our conversion of turning away from bad habits and sin to grow in holiness and friendship. They specifically discuss how this is important in different ways as male and female. Together they will discuss Oprah, the push for abortion up to birth and infanticide, how the pill could affect future children, fighting cell phone addiction, and how the killing of hundreds of Christians in Sri Lanka is relevant to each of us. The attack on women was choreographed so well that a half century later what it means to be a woman is both confusing and may feel out of touch and old fashion. This week Dr. Carrie Gress joins Trending with Timmerie Geagea to discuss her striking new book The Anti-Mary Exposed: Rescuing the Culture from Toxic Femininity. Her findings in the book discuss goddess worship, witchcraft, virginity, motherhood, marriage, and the antidote to the struggles and longing in the female heart. Joy is infectious and is how we are called to live our lives. Diana Wehbe joins Trending with Timmerie Geagea to discuss to discuss the contraception deception and the lie so many women have been told about their happiness and ultimate fulfillment as a single woman. They’ll discuss shacking up and how to find authentic joy in your daily life. Cardinal Sarah has released a new book (forthcoming in English) titled “It is nearly evening, and the day is almost over”. In the book he guides the Church through trying times with a deeper call of living out our Christianity by: renewed prayer on our knees, love of Peter, fidelity to the true teaching of the Church, and fraternal charity. Father Tim Grumbach and I walk through these key areas and how we must answer Cardinal Sarah’s call to greater witness and profound conversion in our own lives. 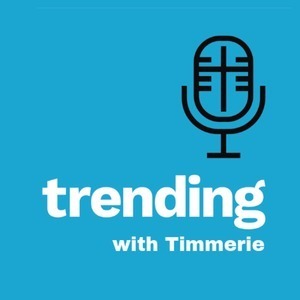 Father Tim Grumbach joins Trending with Timmerie live to discuss how we can counter the widespread impact feminism and effeminacy has had on the culture. They’ll discuss the feather ruffling new biopic on the Motley Crue. They’ll also dive into why Gwen Stefani is delaying her marriage to Blake Shelton. Why are young men opting out of marriage? How do we gain the virtue of perseverance to counter the brokenness of our actions? On Trending with Timmerie is leading actress Ashley Bratcher who plays the role of the former Planned Parenthood abortion clinic director Abby Johnson in the new film Unplanned. Ashley’s character in the movie shows the transformation of one woman who participated in over 22,000 abortions. While filming the movie, Ashley discovered her own shocking pro-life story and is quickly becoming a pro-life activist. Listen up for the behind the scenes story of Unplanned in theaters March 29.